Note: The two bridges across Halifax Harbous were deleted from the above map, as they did not exist yet in 1945. 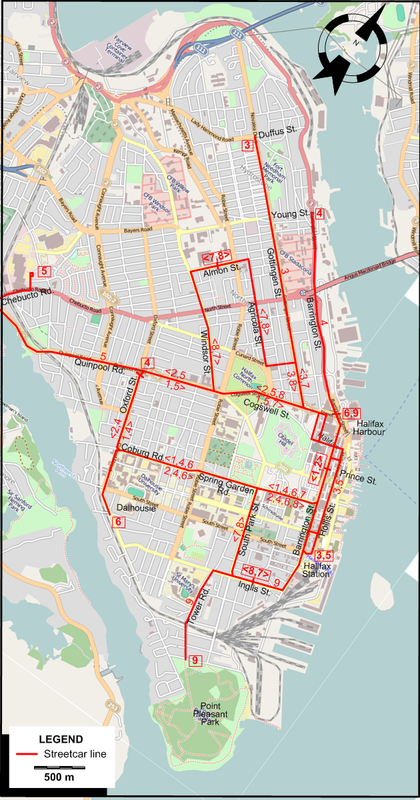 Operator: Nova Scotia Light and Power Company, Ltd.
3 Richmond Halifax Station - Hollis St. - Gottingen St. - Duffus St.
4 Oxford Quinpool Rd. - Cogswell St. - Barrington St. - Young St.
5 Armdale Halifax Station - Hollis St. - Cogswell St. - Quinpool Rd. - Chebucto Rd. Streetcars: (Horse-drawn) 11 Jun 1866 - 21 Oct. 1886; 17 May 1876 - 31 May 1886; (Electric) 12 Feb. 1896 - 28 Apr. 1949.